Brad Bryant, who led after the opening round, watched his shot on the fourth fairway during yesterday's second round. HUALALAI, Hawaii » Jim Thorpe decided after Friday's opening round of the MasterCard Championship that he was going to retire his putter, even though he managed a birdie at the final hole. He picked out a new Callaway flat stick, hit a few practice strokes with it before yesterday's second 18 holes and decided this was the one he wanted. Thorpe only needed it 22 times yesterday en route to a blistering 9-under 63 to take the early clubhouse lead at 12-under 132. Thorpe wasn't able to hold it after several golfers caught and passed him later in the day, including second-round leader Hale Irwin, but he's in contention and has an excellent chance if he needs only 22 putts in today's final round. "Twenty-two is my best putting round ever," Thorpe said. "I found a way to keep your putting average low, you just miss more greens. Honestly, I felt like I could one-putt every green. But you know, it builds your confidence when you keep making those 4- and 5-footers. Tomorrow, if things aren't going well, I might miss a green on purpose, make a 4-footer and get it going again." Happy anniversary: Gary Player stood on the 18th tee only three shots out of the lead when he decided to let one rip like the good old days. Unfortunately for the 71-year-old golfer, who has nine major championships in his bag, he hooked it into the lava field and eventually had to settle for a triple-bogey 7. Player still managed his second consecutive 69 to wind up at 6 under through two rounds of the opening Champions Tour event of 2007. "Anytime you end up with a seven, it's a lousy bit of medicine isn't it," Player said. "To get a seven on the last hole and still shoot 69. I looked at the scoreboard and thought if I could birdie this hole, I'll be within two shots of the lead. That's what I thought. I got a little greedy, I tried to hit it hard and hook it around the corner and I hit just a terrible shot." Player and his wife, Vivienne, celebrated their 50th wedding anniversary Friday night with cake and champagne. He believes he has traveled about 14 million miles in his career and credits his wife with keeping him balanced all these years. "I want to take this opportunity to thank everyone for the great love everyone has given my wife and me on our anniversary," Player said. "We feel it's quite an accomplishment. We hope young people will look at this and say, well you can have difficulties, but you've got to try to make it." And what about shooting your age three days in a row at this winners-only event? "I'm going to try," Player said, who had an eagle at the par-4 sixth. "It has been a great week." Home away from home: It will take a lot to beat Irwin today if history is any indication. Not only did he win this event in 1997, Irwin also captured the 2000 EMI Kaanapali Classic, the Turtle Bay Championship in 2001, 2002, 2003 and 2005, the Senior Skins Game at Mauna Lani in 1999 and the 2001 and 2002 Senior Skins at Wailea as well as the 1981 Hawaiian Open. He also has shared or been in the lead entering the final round 40 times in his career and has closed the deal in 29 of those events. Irwin would have been the second-youngest player to shoot his age had he turned the trick yesterday. Walter Morgan fired a 60 when he was 61 at the 2002 AT&T Canada Senior Open Championship. 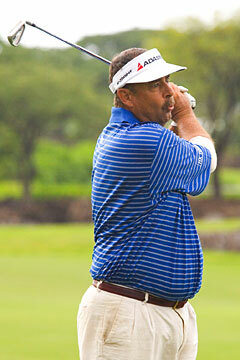 Irwin's 62 yesterday was the fifth time he has shot that score on the Champions Tour. The last time was at the Kaanapali Classic in 2000. The lowest round of his professional career was a 61 at the Southern Open in 1982. He has now managed 11 consecutive rounds in the 60s at this event. Inside the numbers: While Irwin's streak of rounds in the 60s continued yesterday, Dana Quigley's impressive mark ended yesterday at 15 after he shot a 2-under 70. Irwin has had a lot of success in the island chain with nearly $3.9 million in earnings, but Quigley is still the king of Hualalai with just over $1 million in earnings here. Ben Crenshaw is the only golfer in the field not to have a bogey through 36 holes. He shot a 4-under 68 yesterday to sit in a tie for sixth at 11-under 133 with Allen Doyle and Jerry Pate. A record total of 37 golfers finished with rounds under par yesterday, one more than during the opening round on Friday. The easiest hole yesterday was the par-5 10th with a scoring average of 4.244 with two eagles, 28 birdies, 10 pars and one bogey by Don Pooley. The hardest hole was the par-4 second with a scoring average of 4.049. There were five birdies, 29 pars and seven bogeys.